Former Clissett Wood apprentice, Ben specialises in custom made and hard to source green w/w tools to order. Excellent website. The Woodsmith's Store, Maurice Pyle's web site with mail order for green wood and some timber framing tools. Online ordering and card payments. Interesting and informative site on the range of axes hands made in Sweden by Gransfors. For sales, go to Woodland Craft Supplies or The Woodsmith's Store. Association of Pole Lathe Turnerswww.bodgers.org.uk Friendly, 500 strong grouping of pole lathers. Excellent newsletter and course information plus well organised events.Free insurance for members who demonstrate for charity or asan amateur. Excellent newsletter and course information. 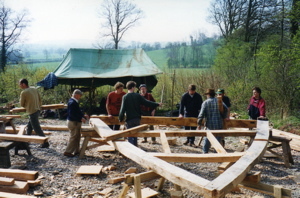 The national organisation for timber framers and organiser of the annual 'Frame' conference and workshops. www.creativebreaks.co.uk Holiday breaks and creative courses in Herefordshire with high class and establishedcraftstutors. Leatherwork courses from this leading leatherworker and author. Self catering cottages near Bosbury. Excellent B+B near to Bosbury. Good food and quiet location. New timber framed building to book for groups and nice gates! 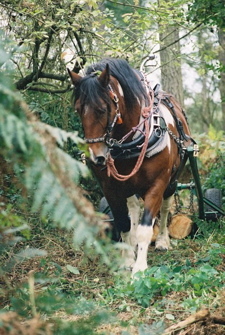 Paul and Jo Morton, managing their own wood selling greenwoodproducts and more. Paul assists Gudrun in her summer courses and supplies Wych elm bark for woven seats. Hinchee Hung, a former student of Gudrun's. Sculptures and site specific installations which defy symmetry and the straight edge. Chris produces a wide range of interior & exterior seating in green and seasoned oak.